How do I reach you or get your prices? You can contact us through our website or email us directly at bill@bpfarmsorganic.com. You can expect a reply back the same day. You can find our prices here. Absolutely! All of our testimonials are unedited emails and texts we’ve received from real customers. 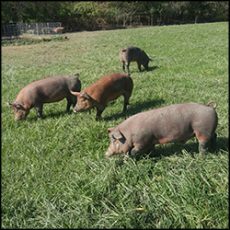 We raise 100% Grass Fed and Grass Finished Beef, Organic Pastured Heritage Pork, Organic Pastured Brown Eggs and Organic Pastured Free Range Chicken on our small family farm. We sell our products both directly to consumers from the farm and wholesale. How are your products raised? All of our products are grown using sustainable, environmentally friendly agricultural practices without the use of antibiotics, hormones/steroids, medications, pesticides, herbicides or genetically modified products (GMOs). All our livestock are humanely raised on pasture. How is your beef raised? How is your pork raised? How are your meat chickens raised? How are your eggs raised? How do I order products you keep in stock? How do I order a share of beef or pork? To order a share of beef or pork please visit our reservation page and complete the form. When we get your reservation request we’ll reserve your meat for you, send you a confirmation by email, and give you a date when your order will be ready for pick up. There is no fee for the reservation list and no deposit required. When it gets close to the time when your meat will go to the butcher, we’ll email you an order form where you can choose how your meat will be butchered. All orders for shares are made prior to butchering. Nothing is pre-packaged. Everything is custom butchered according to your preferences. Depending on how much you order, you’ll have some choices on what cuts you get from your share. Orders for a half of beef or pork can be butchered however the customer likes, limited by what the butcher will do. Orders for quarters and eighths will get more common butchering options since the entirety of each half has to be butchered the same way, and we have to choose options that work best for all parties getting meat from the half. For example, quarters and eighths of beef come with ground beef in 1 lb packages, roasts are about 3 lbs, and the steaks are 1″ thick but you still get to choose if you want stew beef, soup bones, organ meats, and if you want some of your ground beef made into quarter lb patties. When your order is ready we’ll contact you and schedule a time to pick your order up at our farm in Dundee. Orders must be picked up within two weeks of when the order is ready. If you can’t pick your order up in that time frame please make prior arrangements with us. Please let us know when you plan on coming since we aren’t always here. What makes your farm different? 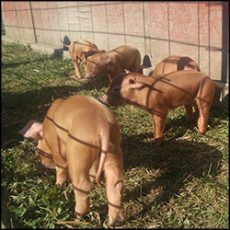 We use only certified organic feeds & supplements which means they are also all Non-GMO. It’s vitally important that you know what the animals you eat have been fed. That’s why we happily disclose our feed ingredients. All seasoning and cures used in our pork processing are Certified Organic, soy-free, gluten-free and GMO-free. 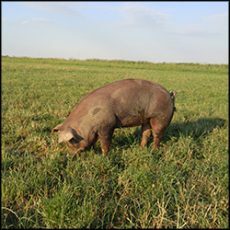 This is rare and hard to find with farm-to-consumer pork. It’s also much more expensive. Many farms, even organic ones, take their animals to processors that use pink cure which is full of chemicals and artificial preservatives. All orders are packed in boxes and stored in freezers at our farm until you pick them up. Most other farms you have to go the butcher to pick up your meat during limited butcher’s hours and pack the meat yourself when you get there. We only charge one price so you don’t have to pay the farm and processor separately. We simplify the process by placing the order with us and picking it up from us. We only use butchers that don’t batch process –– meaning they will not mix meat from different farms together. We make sure we get our meat back from our butchers and only our meat. Majority of butchers combine the trimmings from all the beef or pigs from all the different farms who brought in animals that week and grind them up together. This is a very common practice and they usually do it without the customer’s knowledge. We do not use butchers who do that. The prices listed on the price sheet for shares of beef and pork are per pound hanging weight. Hanging weight is the weight of the animal minus the hide, legs, head, and organs –– just meat and bone. This is the way the meat hangs in the butcher’s refrigerator. You can expect to get 65% to 80% or more of the hanging weight in cuts of meat for your freezer. For beef, the difference in weight is because the beef is dry aged and loses water in the aging process. For standard cutting all the lost weight is water weight. You’ll still get all of the meat that’s in the hanging weight in cuts of beef. There are no additional processing fees to our per pound hanging weight price. Many farms include the organ meats in the hanging weight and it makes a significant different in the cost. We don’t include the weight of the organ meats in the hanging weight for beef or pork. How much space will a share of beef or pork take up? How much meat will I get? Whole Pork: ~160 to 220 lbs hanging weight will yield approximately 120 to 170 lbs of pork and will take up about 6 cu ft of freezer space. 1/2 of Pork: ~80 to 120 lbs hanging weight will yield approximately 60 to 90 lbs of pork and will take up about 3 cu ft of freezer space. 1/2 of Beef: ~260 to 300 lbs hanging weight will yield approximately 180 to 210 lbs of beef and will take up about 6 cu ft of freezer space. 1/4 of Beef: ~130 to 150 lbs hanging weight will yield approximately 90 to 110 lbs of beef and will take up about 3 cu ft of freezer space. 1/8 of Beef: ~70 to 75 lbs hanging weight will yield approximately 45 to 55 lbs of beef and will take up about 1.5 cu ft of freezer space. Can you tell me what the total cost is going to be when I place my order? Prices for beef and pork are per pound hanging weight so we don’t know the total until the animal is taken to the butcher after your order is placed. It takes about three weeks to process beef because it dry ages in the butcher’s refrigerator and about two weeks to process pork because of curing and smoking. However, we find out the hanging weight just a few days after the animals are dropped off at the butcher. We let you know what your total is one to two weeks before your meat is ready for pick up. How often do you butcher? We take beef to the butcher year-round. Availability for beef is just a matter of getting on the list early –– we generally run three to four months out. For pork we currently run two batches a year. One batch that is ready for pickup in late spring and summer and another that is ready for pickup in late fall. Will you split my order up for me? We will not split orders up, whatever size order you place with us is the size order you will receive. If you want to receive two quarters you’ll have to order two quarters. If you want to order a half but need it split into quarters we require you split it up yourself once you get it. All meat is vacuum sealed in clear freezer plastic wrap and each cut is labeled. The meat is then immediately frozen to preserve quality. All meat will be frozen when you pick it up. It can be stored in a zero degree or below deep freezer, preferably not frost free, for up to a year. We also put your meat in boxes so there is no need coolers when picked up. We keep our freezers very cold to help keep your meat from thawing on your way home. What is a share of beef or pork? When you purchase a share of beef or pork what you’re actually purchasing are shares of live animals which are processed on your behalf. That’s why the quantities are halves, quarters, etc. and are priced by hanging weight because you’re purchasing a ‘share’ of an animal which is processed according to your instructions. When the animal you’re getting a share of goes to the butcher, we give the butcher instructions on how you’d like your share processed. Depending on how much you order, you’ll have some choices on what cuts you get from your share. Orders for a half of beef or a half of pork can be butchered however the customer likes, limited by what the butcher will do. Orders for quarters and eighths will get more common butchering options since the entirety of each half has to be butchered the same way, and we have to choose options that work best for all parties getting meat from the half. What do I get when I order a share of beef? Each half, quarter, or eighth of beef is approximately 30% Steaks, 30% Roasts, and 40% Ground Beef and Stew Beef. You can expect to get 65% to 75% or more of the hanging weight in cuts of beef for your freezer. It usually includes these cuts: T Bone Steak, Rib Steak or Rib Roast, Sirloin Steak, Round Steak, Cube Steak, Chuck Roast, Rump Roast, Arm Roast, Sirloin Tip Roast, Stew Beef, Ground Beef, Ground Beef Patties, Soup Bones and Suet. You can also request organ meats like heart, liver, tongue and ox tail. If you get a half or more and don’t want some of the cuts or would like extra ground beef, you can choose on the order form to have some of the cuts ground up. Why don’t you list ribeye, filet, tenderloin, porterhouse, or prime rib in the cuts of beef? The filet/tenderloin is cut as T-bones. The meat that gets cut into T-bones can be cut as tenderloin (which is where the filet comes from) and strip steak or as T-bones. A T-bone steak has the tenderloin on one side of the bone and the strip steak on the other side of the bone. A porterhouse is a T-bone that’s cut from the large end of the tenderloin. A porterhouse is just a big T-bone. Our butcher doesn’t mark any of the T-bones as a porterhouse but they are the same cut. Prime rib is a dish that’s made from a standing rib roast that’s graded USDA prime from conventionally raised beef. There is no prime rib cut. You get the meat that they make into prime rib as either a standing rib roast or rib steaks. If you get a half, you’ll have your choice on the order from. If you get a quarter or an eighth, you’ll get rib steaks. A rib steak and a ribeye are the same piece of meat. The difference is that a ribeye is boneless and a rib steak has the bone-in. What will the lean to fat percentage be for my ground beef and will it be ground chuck, ground round, or ground sirloin? When you order meat with us, the butcher will take all the trimmings and grind them up together. It won’t be listed as chuck, round, etc, only ground beef. The way our meat is butchered is much different than the meat you buy in the store. The reason the fat content is listed on the ground beef you buy in the store is because the processing plants separate the lean and the fat during processing and then they add enough fat back in to make the ground beef the lean/fat percentage they want. It’s not because the chuck, round, or sirloin as more fat than other parts, it’s because they add fat to it to make it 80/20, 90/10, etc. These numbers are ‘artificially’ created based on how much fat the processor wants to add to it. This is also why the higher lean percentages cost more. Our butchers will take all the trimmings and grind them up together. They won’t separate the fat from the lean; it will be ground up as it is when it’s cut off the bones. The fat content of my grass fed ground beef is almost never as high as 80/20 because grass fed beef doesn’t have that high a fat content in it. If I had to guess, I would say my ground beef usually comes out around 90/10 but it could be a little more or less depending on the animal. I buy uncured bacon and ham in the store, can I get my ham and bacon uncured? The uncured bacon and ham in grocery stores is actually cured. The reason it’s called ‘uncured’ is because the USDA won’t let them call it cured unless it has artificial preservatives in it. ‘Uncured’ is the term they use when meat has been cured but without artificial preservatives. If ham and bacon isn’t cured at all it will just taste like regular pork (like a pork chop or pork roast), it won’t taste like ham or bacon. Our ham and bacon is ‘uncured’ according to the USDA definition because it’s cured without artificial preservatives. How do I cook your ham? The ham is cured and smoked but is still raw. If the ham isn’t cured and smoked it will taste like a pork roast. You’ll need to cook it thoroughly. We suggest cooking it in a roasting pan with a little water in the bottom at 325ºF for 20 minutes per lb. Or if you have a meat thermometer, cook until the internal temperature is about 160ºF. Using a meat thermometer is the preferred method and helps to prevent over-cooking. Why is it important that pork is processed with organic seasonings and cures? Conventional pork processing uses a wide variety of artificial preservatives, flavorings, colorings, MSG and fillers/binders in the ham, bacon, sausage and anything else cured, smoked or seasoned. The sugar used in conventional processing is also genetically modified. What types of meat chickens do you raise? What butcher do you use and how do you know you’re getting your meat back from the butcher? We use two small family run local butchers who do a great job. We don’t have bone chips in our ground beef, our stew beef isn’t full of fat, our steaks are nicely cut and the meat is vacuum sealed. We also use these butchers because we can trust them to give us our meat back and only our meat back. We are extremely careful with this as this is a common problem with butchers, particularly with organ meats. Our butchers also don’t batch process anything (when a butcher will take meat from multiple customers and grind it all up together). When we drop off animals at our butcher we get our meat back and only our meat back! Why do you recommend a non-frost free freezer (deep freeze)? Meat will keep longer and stay fresher in a deep freeze (with manual defrost) when the temperature is kept around 0 degrees F or below. A frost free freezer cycles between warmer and colder temperatures to allow the freezer to warm up to just above freezing to let the frost melt and then freezes again. A deep freeze stays at a relatively constant temperature. The higher temperature and cycling of a frost free freezer will make the meat freezer burn faster. But, there are plenty of people storing meat in frost free freezers just fine for months. All our meat is vacuum sealed in freezer plastic wrap which helps the meat stay fresh for long periods of time regardless of the type of freezer. How do you wash your eggs? We don’t use any chemicals, soaps, or cleaners to wash our eggs. Our eggs are lightly hand rinsed with water to remove dirt. We make sure to not disturb the cuticle which seals the egg keeping in moisture and keeping bacteria out. Do you have farm tours? We are a small operation and don’t have regular farm tours. However, we are more than happy to show you around our farm and explain our practices if you’d like to schedule a time to stop by. Do you have a farm store? Do you go to farmers markets? We don’t have a farm store and we aren’t always at our farm. We also don’t attend farmers markets. We are sorry but we haven’t found a cost effective way to ship products at this time. All orders are picked up on our farm. Unless prior arrangements have been made, orders must be picked up within two weeks of when they’re ready. Payments in full are due when you pick up your meat. We take cash and checks but not credit cards. Please make checks payable to BP Farms. If you’re splitting your order with another person please bring one check from the person whose name is on the order form. Combinations of one check and cash are acceptable. If your check is returned not payable, a $40 returned check fee will be charged. For more answers to frequently asked questions about BP Farms, or for more information about organic meat, chicken, pork and eggs from BP Farms, please contact us here. Click here to place an online order for in-stock products. To reserve shares of beef or pork click here.